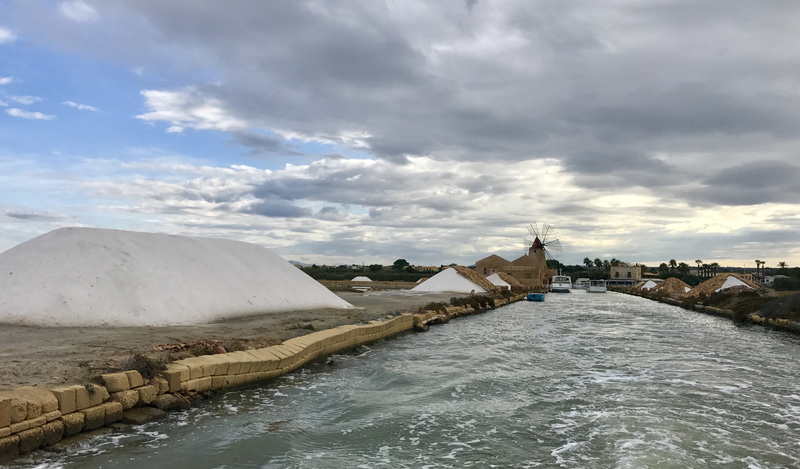 This article originally appeared in the October 2017 issue of Dream of Italy. 2019 update — Sarah just served as guest editor of our Special Report: Palermo. Sarah knows Sicily! 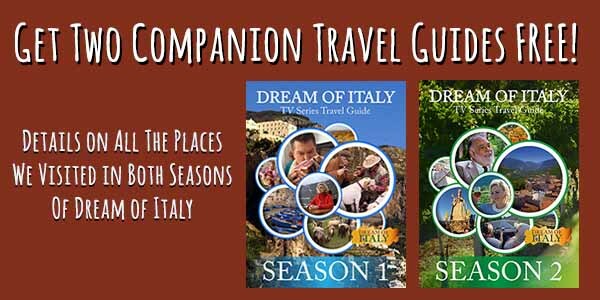 If you have ever visited Italy, it is likely you’ve used Rick Steves as a resource, reading one of his books, watching one of his TV shows, listening to one of his podcasts or even taking one of his tours. Even if you didn’t know it, chances are you’ve encountered Steves’ right-hand woman when it comes to all things Italy – Sarah Murdoch. Murdoch, a former architect and Italy travel expert, has worked for Steves since 2000, spends four months a year in Italy, leading tours for Rick Steves and updating his guidebooks. 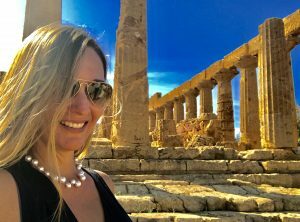 The travel bug bit her when she studied in Rome in 1995. After earning a B.A. in architecture and working as an architect for a few years, she abandoned the drawing board for the allure of the open road. The rest of the year she’s home in Seattle researching and lecturing and being mom to Lucca, 13, and Nicola, 10. 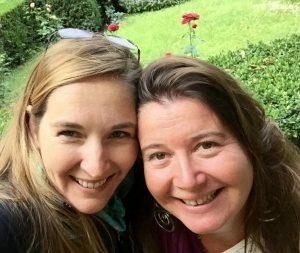 Dream of Italy Editor Kathy McCabe had too many questions for her! Dream of Italy: I’ll ask you the question everyone wants to know. How did you get this job? Sarah Murdoch: I went to Europe with some friends in college and found out about Rick Steves when I went to the office to buy a rail pass. I started working in architecture even before leaving university and was doing pretty well. There were some frustrations, especially feeling like being a woman was a disadvantage in the profession. After a frustrating day at the office, my mother-in-law asked me what I would do if I could do anything. 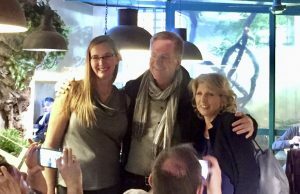 Without hesitation, I said “Oh, I don’t know, write guidebooks for Rick Steves and travel around Europe?” She said, “Well, why don’t you?” I sent in a resume on a whim, not really being serious about it, because I had a very good job as an architect. I just thought, why not? And they called me. I took a job in the office to get a foot in the door, but once I went out on a tour, I found the job I was made for. DOI: How does your degree in architecture inform your tours and guidebook research? SM: I eventually wanted to be a professor of architecture history; that was my plan in the architecture world, and in a sense I have achieved that! I have a passion for history, and architecture is one of the best ways for people to understand the civilizations of the past. Architecture isn’t just practical, it speaks about the values of the people who built it. I use architecture as a lens to help my clients discover more about the place we are visiting, tracing the development of the urban fabric and what that evolution means for the people in a particular place. I am also an artist in my heart. I feel that architecture is the only truly interactive art form. I really enjoy explaining buildings and pointing out how we interact with them on an emotional as well as physical level. DOI: I love to know how the sausage is made when it comes to travel writing. What is the process for updating the guidebook? SM: We update them yearly, some biannually. The guidebook work is an honor and a huge responsibility, considering how many people rely on our independent evaluations and recommendations. It is an art form. Rick has personally trained me and has quite the work ethic. People think it is very glamorous but it is very difficult, long hours and physically taxing. You get up in the morning and make a plan over breakfast. We always try to visit hotels in the morning after check out and before check in. Even if they show me the best room, I have done this so long, I can tell what the problems are from looking at one room – if it is well-run, clean, a good value. In the afternoon, I go to museums and sites, checking every price, timetable and strategy for a better visit. In the evening, I go to restaurants – obviously, we can’t eat at all of them. We rely on our readers as our best critics. If I see someone with a guidebook on the table, I ask them what they think. Then I spend the rest of the night typing until about 1 a.m. and get up at 7 a.m. the next day. The most I have ever done is five weeks straight and it was exhausting. Even if the workload is ridiculous, I have the advantage that I’m also a tour guide, I know these cities inside and out. I think that is the reason we write the best guidebooks, we are not just writers but tour guides who have a deep knowledge of places and personal contacts with the best information. 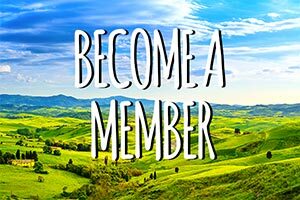 DOI: This year you updated the Rick Steves Florence and Tuscany book and Rick Steves Italy’s Cinque Terre. Can you tell me your best new finds in each area? SM: My favorite new hotel for the 2018 edition in Florence is Palazzo Guadagni (39-055 -2658376) on Piazza Santo Spirito. I remember when this hotel was a ramshackle backpacker’s dive, it used to be called Sorelle Bandini. I hadn’t been there since the early days of guidebook research, more than a decade ago. I knocked on their door out of pure curiosity about what had happened to the hotel…and it is wonderful. The top floor loggia has stunning views. I’ve even gotten a few of our tour groups to stay there next year. Directly under the hotel, right on the piazza, is a great restaurant I’ve added as well, called Tamero. It’s a funky and fresh pasta bar in an old automotive garage. They make the pasta fresh in an open kitchen. I’ve done a couple of tour group dinners here, and my clients loved it. It’s rare to find anything truly new in Tuscany, but I did find something cool in San Gimignano, of all places. They have recently opened up a tower house as a museum. It’s a period home, furnished with the former owner’s belongings and displaying their story. They have a section of tower house visible with the floors cut away, to see the structure. Very cool. I love period homes and try to find one in each city I research. I think it really connects you to the history in a personal way. The Cinque Terre is the jewel of the Rick Steves world. Everyone loves it…so it’s pretty crowded these days. 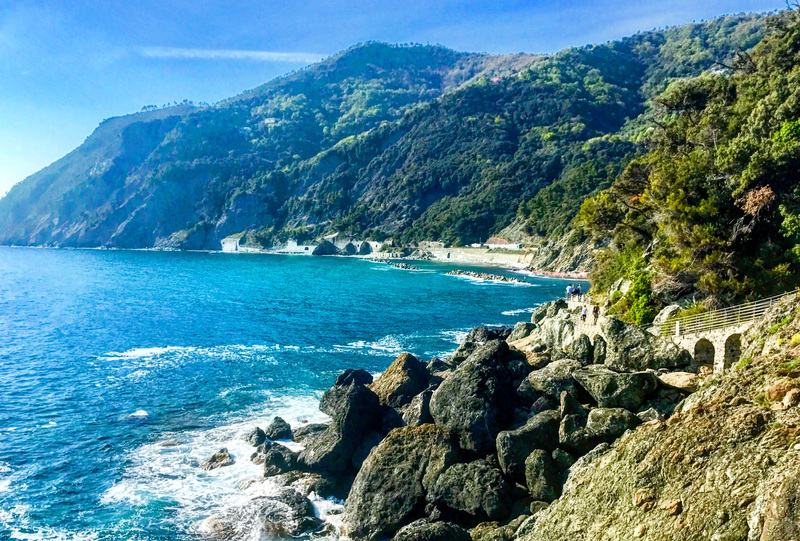 I have been working with my local friends, including Ruth Manfredi from Save Vernazza to try and give visitors better ways to visit the Cinque Terre and avoid the crowds. About half of the trails remain closed, unfortunately the easiest ones, so I went in search of a trail experience that anyone could do. Ruth suggested Framura, a little series of towns to the north of the Cinque Terre. You can walk or ride a bike on a flat trail from Levanto, then do the cliff-side walk at Framura to a pretty little beach. Anyone can do it! It’s brand new this year, and I’ve written it up for the 2018 edition. 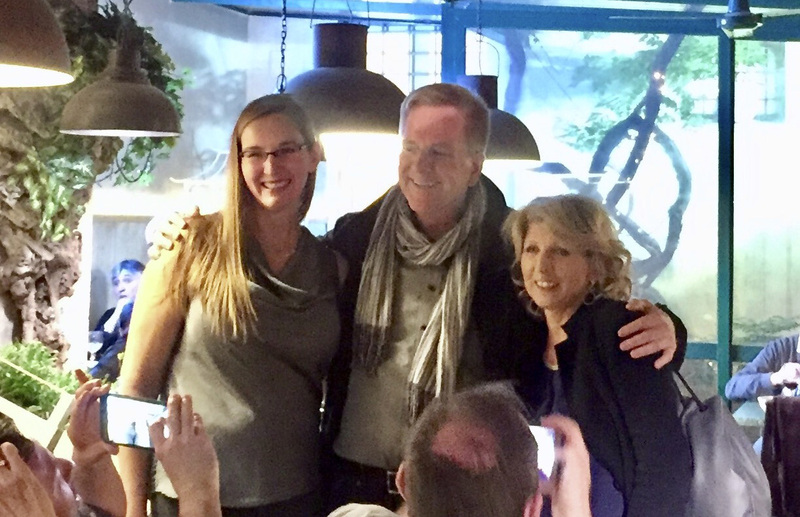 DOI: What’s a typical day like when you are guiding a Rick Steves tour? SM: Today was a good example – we started about 9 a.m. We were joined by a local guide with expert knowledge of the area. 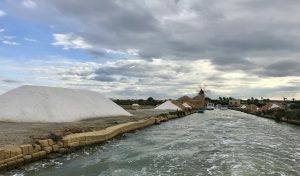 We took a boat ride out to an island in the salt flats of western Sicily, and got a tour of the Phoenician ruins there. I arranged a country lunch on the island with fresh salads, pasta, cheese and bread, with plenty of local wine from the island. We came back in the afternoon and had free time, then a happy hour on the hotel roof terrace before dinner. I always encourage time for fellowship on my tours, because the social aspect is often a highlight that people don’t expect. Then I head to my room for a little organization time and sleep. Then I do it again! DOI: How has Italy changed in the years you have been visiting? SM: I could write a book on that. I am privileged to have been around to see the change. When I studied in Rome in 1995, it was not the Italy you see today. We had to live without a supermarket – you would go to a butcher, then the pasta shop, etc. Quite a shock. Siesta time closed down cities every day for hours, it was hard to get things done. To make phone calls, I had to use a public phone in a bar, using gettone (tokens). Sometimes the power would be out for no reason. I had to boil water to take a hot bath in my apartment’s tiny squat bathtub. There was no simple answer to anything. Sicily now feels like the Italy I remember, a little wild and untamed. I’m a little untamed myself, so I relate better to that Italy of the past. I’m concerned for the Europization of Italy and the dilution of the culture. For example, the Campo de Fiori market in Rome has changed severely, all the traditional vendors have had to move out because of EU hygiene regulations and now it is a touristic market. DOI: What’s the biggest mistake travelers to Italy make? SM: It is a mistake to force Italy to behave the way you want it to or apply your standards and expectations on it. The biggest example I see is an American speaking really loud to an Italian waiter asking for ice. Italians don’t typically use ice in soft drinks, sorry. Italy is not going to change for you. You have to let it charm you and accept it as it is. DOI: What is the next up-and-coming area? SM: Sicily. Sicily is a passion of mine. It is one of the most diverse and beautiful places in Europe. Most people have no idea what is here to discover. There are traces of almost every major ancient western civilization. The landscape is diverse and picturesque. The food is fantastic. The people are friendly. Mainstream tourism hasn’t caught on yet. I suggest you go soon, it won’t be a secret much longer! Most people have seen The Godfather but don’t realize that there is so much more to it than mafia stereotypes. Every day I ask my tour group if they expected Sicily to be this way and they cannot believe it, no matter how they have prepared. Beautiful beaches, snowy volcanoes, lush valleys, temples, museums. This island has it all. Did I mention the food? DOI: If you could have a last meal in Italy where would it be and what would you order? SM: I would have a meal made by Stacy’s husband Domenico in Venice. He’s the chef at Osteria Bentigodi (39-041-8223714) in Canareggio. He’s a magician and artist. I never ask for anything particular, I just let him imagine something using the seasonal produce he has on hand. I recall a particularly delicious wild strawberry risotto a few years ago. DOI: What’s your best advice for a strategy to plan your trip? SM: Start with priorities. The biggest mistake people make is to go to the places they think they should rather than where they will enjoy. Do you have to go see the Vatican Museum? No. It is a miserable experience normally and dangerously crowded on occasion. Most people go because they think they should, not because they want to. Most people would be happier to see the Borghese Gallery or ride a bike along the Appian Way. Do what you enjoy, not what someone tells you that you must. And we have to dispel this idea – I know that we have promoted it – that September is a good time to go. That was true many years ago, but now it is high season and super crowded. Any month is better. Go in April! Spring is lovely and not crowded at all. Seriously, don’t go in September or early October unless you enjoy sardine-like crowds. DOI: What’s your best packing tip for traveling to Italy? SM: Italy is a patchwork of climates, from the Dolomites to the sunny beaches. You can leave snow and lay on the beach in the same day! The best strategy is to pack layers. I prefer ultralight layers of clothes in natural fibers like linen and silk. Silk is a miracle fiber, it is surprisingly warm but works in the heat as well. I bring dresses, they are easy to layer with leggings and a sweater. Italians love to layer clothes as well, more for the style, so you’ll fit right in! 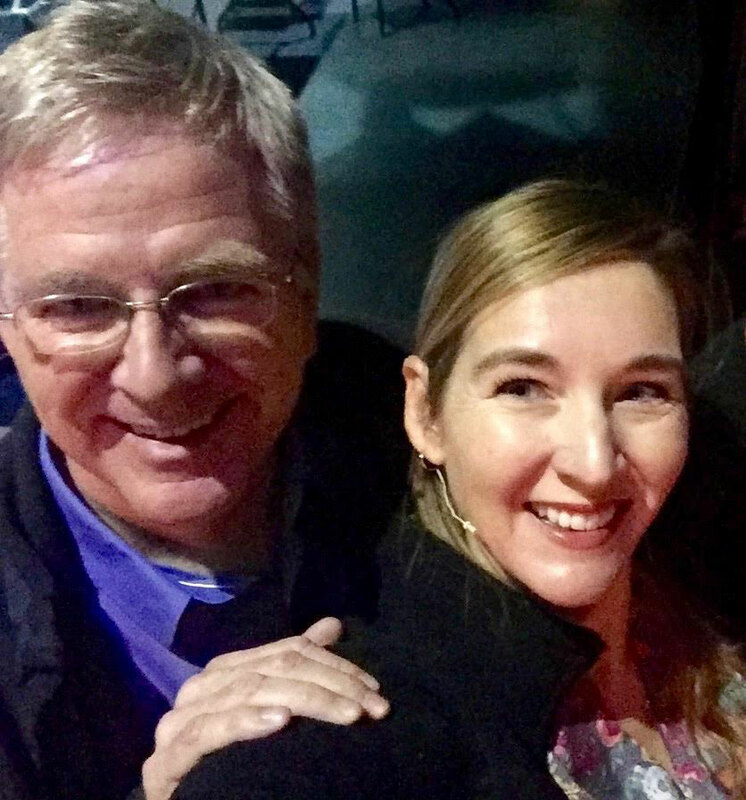 DOI: So what’s Rick Steves like and how has he changed travel? SM: He has many facets. He’s the Martha Stewart of the travel industry – totally self-invented. He works harder than anyone I know. He is a very savvy businessman and a deeply caring employer. I have so much respect and fondness for him, and have learned so much over the years from his example. He’s given me a beautiful life and connected me to some of the people I love most. He’s changed travel for the better, at least I hope so. We encourage travelers to learn, live local and be sensitive. We have tried to break the mold of typical tour companies. We work in an honest way. We, the tour guides, are all passionate about our subjects and help our groups to travel like locals, to appreciate real experiences, and to support local economies. Our travelers, in my view, are the gold standard of the travel industry. DOI: Tell me about your favorite locals in Italy. SM: My favorite local in Venice is my friend Stacy Gibboni. We met while I was doing guidebook research. She was running a B&B out of her Venetian palazzo and I came to update the listing. We immediately clicked and I blew off research for the rest of the day to drink Prosecco with her! She is a contemporary artist and paints gorgeous canvases. In the Cinque Terre, my “sorella” Giuditta Bernardi is my favorite. She runs a restaurant in Monterosso called Piccolo Diavolo (39-0187-801528) which is the best in the Cinque Terre in my opinion. I’ve known her since she was a kid, and she came to live with my family last year for a couple of months. I wrote about her in an article on my blog, “The Italian in the Basement” and people have come in to the restaurant and called her that! In Rome, one of my favorite characters in the famous Paola Fazi. She runs Trattoria der Pallaro (39-06-68801488), a restaurant near Campo dei Fiori. She’s like my Roman aunt. Her restaurant has no menu, you eat what they are cooking. That restaurant hasn’t changed in 50 years, it’s like a time warp of the way Rome used to be. She’s been feeding me for more than 20 years, and now she’s feeding my kids too! DOI: How can our readers find out more about what you do? SM: You can read my blogs at www.adventureswithsarah.net and www.adventuresinsicily.com. 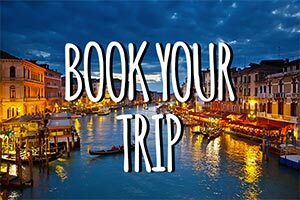 I’m creating my own off-season tours for Italy and you can get my latest schedule by emailing sarahinitalia@yahoo.com. I also offer my own tours to Cambodia and Thailand. To find out about the Italy tours from Rick Steves, visit www.ricksteves.com/tours.